As a candidate for Mayor, Michael Nutter boldly promised he would create an "Honest Budget Now." While previous administrations routinely hid money from public view, excluded the public from any meaningful role in the budget process, and flat-out misrepresented the city's financial condition, Nutter's pledge was profound. "The budget process in Philadelphia is the ultimate game of inside baseball," Nutter wrote. "In Philadelphia, public participation is largely absent and I will change this." But halfway through his mayoralty, that promise has faded and business-as-usual budget practices continue. After some promising early signs in the Mayor's first budget, and some attempts at inclusion in his second budget, "honesty" seems to have been cut from the budget process. The budget is more than a plan to raise and spend money and more than a list of the winners and losers in the competition for public resources. The plan articulated in the city budget represents the most concrete expression of the City of Philadelphia's civic will. Our collective hopes and aspirations may be voiced in many different ways, but only the budget documents the citizenry's good intentions as a set of assumptions and priorities. The budget places what we value in rank order and defines our concerns and our collective response to the myriad challenges that confront us. It is, of course, our money that we are budgeting and we deserve nothing less than a completely transparent process to decide how our money will be raised and spent. But we can only engage in that process if we have true and complete information and we can only make a difference if our budget is an honest one. Mayor Nutter promised to end the dishonesty. "City budgets are too important to be left to the politicians," he said. "It's time to put away the smoke and mirrors and bring out the sharp pencils." Perhaps the most important movement toward an "Honest Budget Now" is spelled out in six words -- "Reserve for Wage/Health Benefits Increases." Especially in approaching contract negotiations with the municipal workforce, the conventional wisdom has been to build a budget as if not even a single dollar could be spared to increase salaries and benefits for city workers. The thought was that admitting to any ability to fund raises would establish a "floor" for negotiations. Of course, everyone understood that during the negotiations, the city would find a way to pay something for raises, but the subterfuge made the budget a fiction and created a game of finding the stashed money. Most problematic, the charade generated lingering animosity between the unions and management -- unions consistently walked away from the bargaining table convinced that, despite whatever increases had been won, the city was still lying about its ability to pay more. By putting forth an amount for future union pay and benefit increases, the Nutter administration essentially says, "here's what the city can afford…if we are to pay more, we will have to change our budget priorities." Such an approach should help focus union negotiations on creating labor-management consensus on a way to deliver quality city services at reasonable costs. What remains to be done? On the campaign trail and in "Honest Budget Now," Mayor Nutter spoke of the need to establish a Rainy Day Fund to deposit annual surpluses and establish a reserve for lean years. Perhaps more important, this mechanism, recommended by government-finance professionals everywhere, helps ensure budgetary honesty by making it more difficult for the mayor to hide money, since unspent money would be claimed by the Rainy Day Fund and unavailable for a mayoral spending spree. In second guessing the Mayor's decisions, many are wondering whether he could have cut spending that does not directly affect service delivery or increase other city revenues without affecting the city's planned schedule of tax reductions. Unfortunately, because the Mayor chose to craft his budget-adjustment plan behind closed doors, we have no idea which other options he rejected, which ideas he never considered, and which assumptions he made to guide his decision-making process. When the public balked at the Mayor's plans to close libraries and make other unpopular cuts, the Mayor reconsidered and conducted a public discussion about the budget last winter. Ultimately, the process was more successful in engaging the public in a civic exercise and less successful in shaping the budget as the Nutter Administration gave only cursory attention to the public's input. As the city's fiscal condition deteriorated, so did the idea of an honest budget. In his second budget, instead of keeping a place holder in the budget for the cost of future contracts with the city's municipal unions, Nutter put forward a spending plan predicated on no salary increases for workers for five years AND reductions on health and pension benefits of $25 million per year. The Mayor clung to this ludicrous assumption as he lobbied for a Sales Tax increase and the ability to defer pension payments to balance his budget, threatening to implement a "Plan C" that would shut down the city courts and layoff police and firefighters (while favored mayoral initiatives would somehow avoid the budget axe) unless he got what he wanted. Of course, it was no surprise that just weeks later and after getting the tax increase he sought, the Mayor was suddenly able to make room in that budget for millions and millions awarded to the police in an arbitration. (Surely this will be soon followed by additional millions for firefighters and the city's white- and blue-collar workers.) Make no mistake, raises for our unionized employees are not necessarily troubling. But a dishonest budget that does not allow the public to have a true say in how our money is spent is a very bad thing. The third Nutter budget will be introduced next month, debated in the weeks ahead, and finalized before the end of May. There will clearly be no meaningful public participation in establishing our civic priorities and any public input will be an afterthought to a budget that the administration has been quietly putting together since last summer. Despite the Mayor's own criticism, the budget process in Philadelphia is still the ultimate game of inside baseball. Mr. Mayor, we are still counting on you to put forward an honest plan to raise and spend public money so we can have a true debate about concerns, or priorities, and our aspirations for Philadelphia's future. 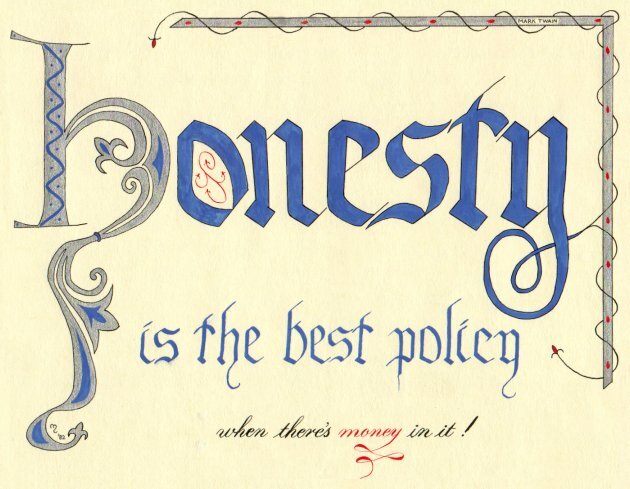 Honesty is still the best budgetary policy.